Fall is pumpkin time: Hokkaidos and many other pumpkins are in high season from September through November. If you’re already tired of pumpkin soup, here are three more delicious ideas for what to do with those gorgeous golden yellow gourds. These family-friendly recipes have all been thoroughly tested. Enjoy! Our first tasty alternative to pumpkin soup is even vegan: pumpkin curry. Coconut milk lends it a light Asian touch; you can spice it as you like with the addition of chili powder. It’s great served with a side of rice. First halve your pumpkin and remove the guts. Cut one half into slices as thick as your thumb, then cut those slices into edible chunks. Wash the onions, remove the root ends, then slice them into small rings. Sweat the onions in a pan with a bit of oil. When the onions have softened, add the pumpkin chunks and 2-3 teaspoons of curry seasoning. Then add the coconut milk and chili, salt, and pepper to taste. Start boiling your rice. After 20 minutes on low heat, your pumpkin should be soft and cooked through, at which point the curry is ready to serve. Bon appetit! A popular fall treat across Europe is Alsatian tarte flambee, a French thin-crust pizza served with cream rather than red sauce. This vegetarian recipe uses pumpkin and goat cheese, but you can substitute feta if you prefer. First knead together the flour, oil, water, and salt into a smooth dough, dividing it into two balls. Place in the refrigerator to rest for 30 minutes. Quarter your pumpkin, clean out the guts, and cut it into extremely thin slices (around the thickness of a wedding band). Parboil these for five minutes in boiling water, then remove to a towel to dry. While those boil, stir together the cream cheese and sour cream. Once your dough has chilled, roll one of the balls out onto a lightly floured baking sheet. The dough should be thin and stretched to the edges of your baking sheet. Tarte flambee is charmingly uneven, so don’t strive for perfection. Spread the cream cheese/sour cream mixture across the dough and then cover completely with the pumpkin slices. The final step is to crumble the goat cheese or feta atop the pumpkin before baking in the oven (350 degrees F, convection when possible) for 20 minutes. Your pumpkin tarte flambee is done when the cream between the pumpkin slices is golden brown. After removing from the oven, drizzle 3 T of the honey over the tarte. Ensure that you drizzle enough honey over the goat cheese. Repeat the necessary steps for the second tarte while the first is baking, and enjoy your first portion while the second bakes. For all fans of quick fried dishes, here’s a pumpkin potato fry up that can be served with or without meat, your choice. First boil the potatoes in salt water until cooked through. Allow these to cool before quartering. 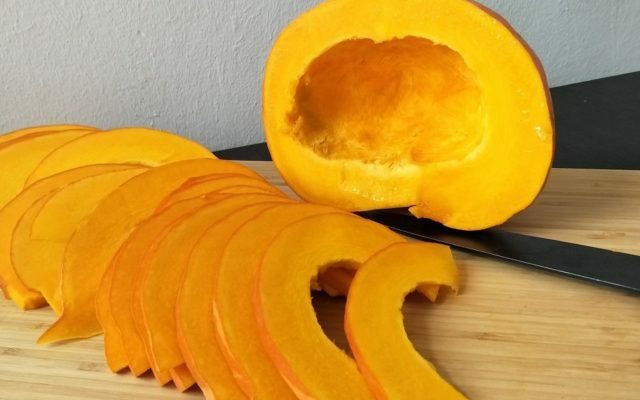 While the potatoes are boiling, halve your pumpkin, clean out its guts, and cut it into bite-sized pieces. Add the quartered potatoes and pumpkin pieces to a hot pan seasoned with oil. After approximately 10 minutes, the pumpkin and potatoes should be golden brown on the outside; add the chopped onions. If you’re adding turkey, slice the meat into thin strips and add it to the pan. Season with salt and pepper and add oregano, rosemary, or thyme as you prefer. After 4-5 minutes, taste again and add more seasonings if necessary. 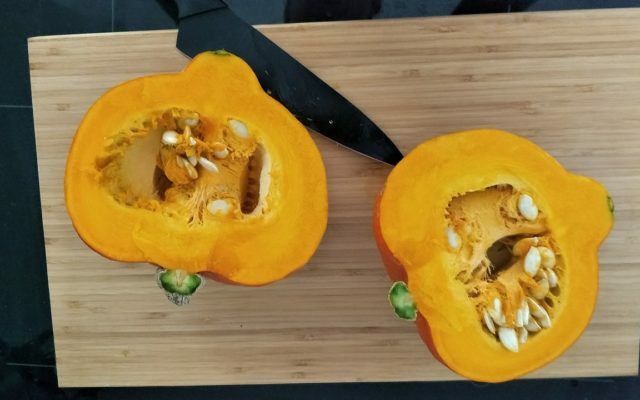 Hokkaido and Squash: Which Pumpkins’ Skins Are Edible?